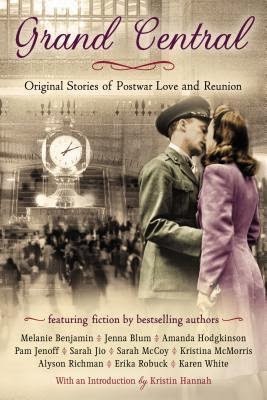 I’ve found myself drawn to stories of WWII lately so when this compilation of short stories surrounding Grand Central station at the end of the war fell into my inbox I was thrilled to be able to accept it for review. The novel is made up of ten different short stories, all written by bestselling contemporary female authors and each one pivots around Grand Central station in New York at the end of World War II. One of the most fascinating things for me was the variety of people and scenarios that come from ten different writers. Each snippet of the lives explored was unique as was the pain and joy they were experiencing from the one horrific historical event in our shared history. I would imagine each reader would be attached to a different story and there were a few that have stuck with me but I will only mention one here. The Branch of Hazel was haunting and I was drawn to Cata’s story partly because of the subject and party because author Sarah McCoy didn’t give us a lot of ways to be attached to Cata. I wanted desperately to feel more attachment for her and this was probably the reason I was so compelled by her story. The Nazi program to populate the earth with “perfect aryan babies” using nazi soldiers and state approved German maidens is so appalling a concept that you can’t help but want to get inside the head of one of the girls approved for reproduction- to see how this affected them. To conceive children you know will be taken away, and do it repeatedly, had psychological repercussions for not only the women but the children born into the program. The world is entirely aware of the grotesque horror surrounding WWII but this story dove into one aspect that isn’t made much of- and had equally damaging effects on some aspects of society. I was impressed with all the contributors to this anthology. My only quibble was that there were some little ties between the ten stories, glimpses of a character from one in another author’s work. I wish they had either committed to having the people appear in each other’s tales or left them entirely separate.